I do love a good Gothic novel - and I've got a bit of a thing for spooky castles and crumbling ruins. And I do rather like wearing black. OK, yes, I might be a bit of a Goth from time to time. 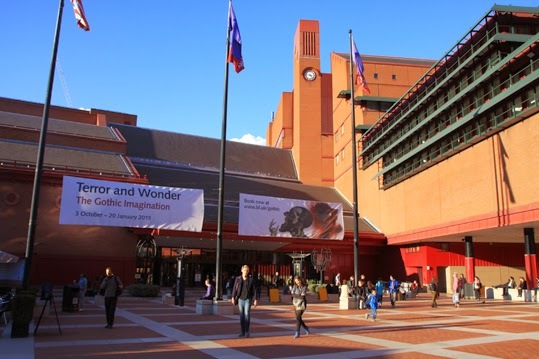 Which means the new exhibition at the British Library called Terror and Wonder: The Gothic Imagination was right up my street and I made a point of visiting it shortly after it opened at the start of this month. As much I thought I'd enjoy what is described as the UK’s biggest ever Gothic exhibition, it surpassed my expectations. It is huge, with rooms covering a lot more than just literature - and seeing as it is on at the British Library I did think it would be mostly about books. In fact, the description on the British Library website shows just how much Gothic ground it covers: "Two hundred rare objects trace 250 years of the Gothic tradition, exploring our enduring fascination with the mysterious, the terrifying and the macabre. From Mary Shelley and Bram Stoker to Stanley Kubrick and Alexander McQueen, via posters, books, film and even a vampire-slaying kit, experience the dark shadow the Gothic imagination has cast across film, art, music, fashion, architecture and our daily lives." It does begin with a book though - Horace Walpole’s The Castle of Otranto, which signalled the start of Gothic literature in the 18th century. The genre is typified by plots of love and death, often set in castles or abbeys and involving some ancient family curse or terrible secret. It also shows a fascination with the medieval past, wild landscapes and the supernatural. Modern-day horror has its roots in Gothic's dark romances. The exhibition does of course include a lot of beautiful and rare books and documents, including handwritten drafts of Mary Shelley’s Frankenstein, Bram Stoker’s Dracula and posters, books and video clips from modern horrors such as Clive Barker’s Hellraiser. I was also fascinated to see on display one of Harry Price's Blue Books - the set of instructions the ghost hunter gave to each of the 48 investigators during the study of Borley Rectory in 1937. Oh and if you want to see John Dee's dark mirror this autumn, you won't find it in its normal place at the British Museum as that is also part of Terror and Wonder. The famous obsidian disc was once owned by Horace Walpole. I would recommend allowing at least an hour and a half to enjoy the exhibition. You need to buy a ticket in advance with timed entry and I would suggest getting one for the morning or early afternoon to have enough time to go round. Tickets cost £10 for adults, but are free for under-18s and friends of the library. I got in for half price because I have an Art Pass. And here is a little tip for another Gothic-type thing to do after you've been to the British Library - pop up the road to St Pancras Old Church and see the Hardy Tree.